I would like to say a few words on the publication of the "White Paper on CESA Games 2018". Looking back on last year's game industry, we can observe that in addition to the development of the game market for smart devices, the home video game market became more active. We can see that many users are enjoying playing as new game consoles and popular game software were released one after another. As a recent global trend for the game industry, "eSports", using competitive computer games has become popular. As a result of coordination between related parties to support this movement domestically, the three existing eSports organizations were integrated as well and the "Japan esports Union (JeSU)" was newly established. We think that this market will expand in various ways in the future as different ways of enjoying eSports develop, including many people starting to watch the competition between outstanding players and their playing styles, in addition to enjoying playing themselves. Under this industry environment, we are pleased to deliver this publication that contains objective data detailing the changes in the gaming market both domestically and internationally. Summarizing the research results for the home gaming market in 2017, the domestic market's size based on the retail numbers is 192.4 billion Yen for hardware, 194.2 billion Yen for software and 386.7 billion Yen in total. The above numbers for market size are estimated from packaged game sof t ware and other than this, we estimate that the domestic market for downloaded game software is 16.8 billion Yen. On the other hand, the size of the international market is 1.3475 trillion Yen for hardware, 1.4406 trillion Yen for software and 2.7881 trillion Yen in total. In addition to the above, this publication also contains data for related markets, archive data, etc. At its beginning this publication also contains a contribution from the medical community on a game related trend with the theme of "Promoting Game Accessibility for People with Disabilities". It is an interesting article which we hope you will enjoy as well. 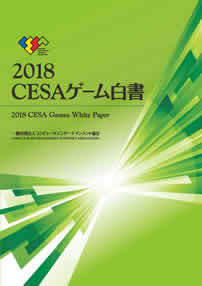 Finally, I want to thank all the members, related companies and non-member game producers who helped us to research and publish the "White Paper for CESA Games 2018", the people from the Commerce and Information Policy Bureau of the Ministry of Economy, Trade and Industry, who always assist us greatly and all the people who provided gaming market related data. Once again I would like to take this opportunity to thank you and ask for your future understanding and cooperation with the Association.